Reggie Johnson ushers the second coming of Extra Rice, Inc. They may not have been as heralded as the duos of Francis Arnaiz/Robert Jaworksi, Ronnie Magsanoc /Benjie Paras, Alvin Patrimonio/Jerry Codinera or even the two Dannys (Ildefonso and Seigle) in PBA lore, but the Extra Rice tandem of Beau Belga and JR Quinahan made their presence felt during their time as a duo in the league’s modern era. But just like other tandems before them, the Belga-Quinahan duo didn’t last as well. 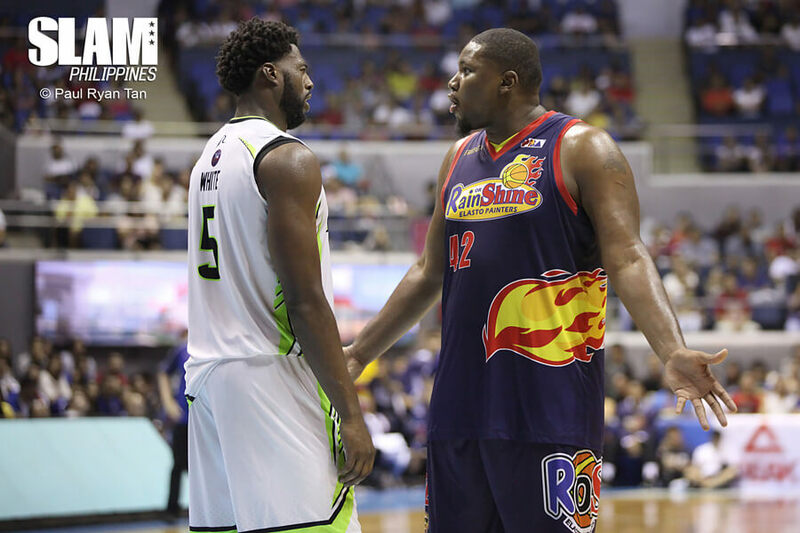 Even though they both had essential roles in the franchise’s two PBA crowns in 2012 and 2016, Quinahan would get the boot as he was shipped to GlobalPort before reuniting with Guiao in NLEX while Belga stayed put at the Elasto Painters camp. Rain or Shine still managed to render decent records and enter the playoffs after Extra Rice, Inc. was dissolved, it wasn’t quite the same back when the two hulking giants were patrolling the middle. Also, in the first four conferences after the team released Quinahan prior to the start of the 2016-17 season, Rain or Shine never made it beyond the quarterfinal stage. It didn’t help that the team had to encounter teams such as San Miguel Beer and Barangay Ginebra in the opening stages of the playoffs, squads that have an obvious advantage in the frontline compared to the Elasto Painters. After the team suffered another early exit in the playoffs in this season’s Philippine Cup courtesy of Ginebra, it was obvious that in order for Rain or Shine to be a competitive force once more in the league, there is an imperative that they return to a tried and tested formula that netted them success before. This didn’t mean bringing back Quinahan, team management did made significant move by enlisting the services of former University of Miami Hurricane, Reggie Johnson. In six games so far for Rain or Shine, Johnson has tallied averages of 25 points, 17 boards and 3.8 dimes while carrying his squad to the top of the standings with a 5-1 slate. More importantly, he has provided a solid presence in the paint that compliments well with the likes of Belga, Raymond Almazan and Jewel Ponferrada in the Elasto Painters’ frontline rotation. This was particularly evident during the team’s fifth game of the elimination round versus the San Miguel Beermen. Matched against Fajardo, this season’s number 1 pick Christian Standhardinger and import Troy Gillenwater in the paint, Johnson fired 27 points and grabbed 19 rebounds, all the while giving the four-time PBA MVP fits with his offensive arsenal. Johnson powered through the Beermen big men in the paint or pulled them out of the shaded lane for outside shots. But it wasn’t Johnson’s show on offense alone that highlighted Rain or Shine’s victory over the defending champs. By being a legit threat down low and attracting double-teams in the process, it enabled other Elasto Painters, especially his partner in the post Raymond Almazan, to inflict damage on the Beermen as well. Almazan had one of his best games in a while with 25 points and 14 rebounds. Part of this can be attributed to the Beermen focusing on the Rain or Shine import, freeing up the other four Rain or Shine players on the floor. Almazan definitely made the most out of this opportunity as he shot 9/14 from the floor in only 23 minutes of burn. Aside from contributing in almost every statistical category available, Johnson was also provided the necessary intangibles such as giving solid picks, setting screens and box-outs for his teammates to wriggle free and either hoist away or grab the caroms off the glass. He got checked early on by Globalport Batang Pier’s defense during his team’s last outing. But Johnson still contributed to his team’s cause thru hustling on both ends. 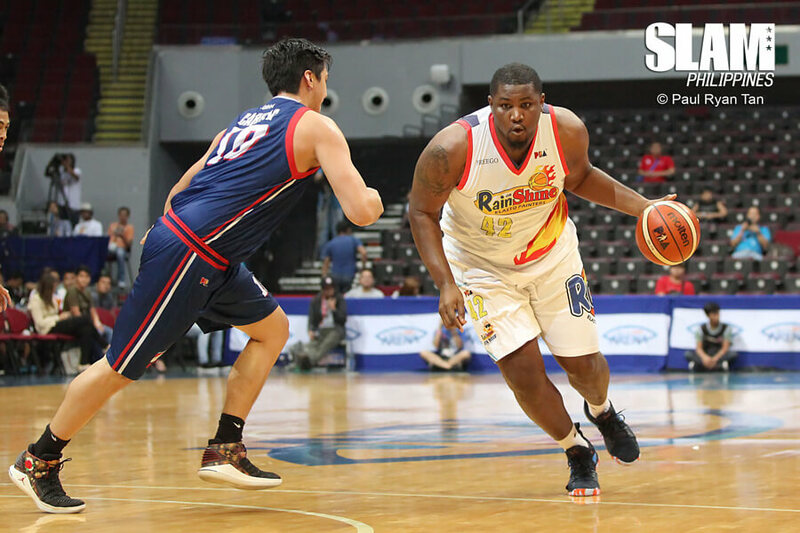 That enabled Rain or Shine to have the edge in second chance points by game’s end, good enough for the Elasto Painters to enter the PBA All-Star break with the best record in the conference. Although this iteration may just be for a limited run only, it is nonetheless a refreshing sight to see the revival of one of the more renowned duos in the PBA thru a workhorse of an import in Johnson. Should he remain consistent in his role for the rest of Rain or Shine’s campaign this Commissioners’ Cup, then another title run just might be on the horizon for the squad, courtesy yet again of the Extra Rice, Inc.